WILMINGTON, N.C. – Cape Fear Museum has been awarded $15,000 grant from the PNC Foundation to expand pre-kindergarten programs and develop evening programs for underserved children and their families. The PNC Foundation provided the funding in support of Grow Up Great, its bilingual program in early childhood education. Activities will be designed to encourage families to work together, spark curiosity and build enthusiasm for learning while introducing topics related to science, technology, engineering and math (STEM). During every event, families will work with professionals, teachers and museum educators to engage in fun, inquiry-based activities and explore the world around them. Cape Fear Museum is a nationally-accredited museum with educators trained to support pre-k and early elementary learners. The PNC Foundation, which receives its principal funding from The PNC Financial Services Group (NYSE: PNC), actively supports organizations that provide services for the benefit of communities in which it has a significant presence. The foundation focuses its philanthropic mission on early childhood education and community and economic development, which includes the arts and culture. Through Grow Up Great, its signature cause that began in 2004, PNC has created a $350 million, multi-year initiative to help prepare children from birth to age 5 for success in school and life. 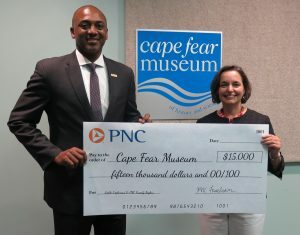 Photo: PNC Commercial Relationship Manager and Cape Fear Museum Associates Board Member Patrick Boykin presents a check to Cape Fear Museum Director Sheryl Mays.